Apple has joined the list of donors who have pledged to support restoration of the fire-damaged Notre Dame Cathedral in Paris, with total donations now exceeding €600 million. Tim Cook, CEO of tech giant Apple, said he was "heartbroken" at the news of the fire, which broke out on the evening of 14 April. "Apple will be donating to the rebuilding efforts to help restore Notre Dame’s precious heritage for future generations," he wrote on Twitter. The amount Apple will contribute has not been disclosed. French President Emmanuel Macron promised this morning that the centuries-old Notre-Dame Cathedral, which had been undergoing restoration works at the time of the fire, would be rebuilt and donations have poured in from around the world. The first pledge came from the Pinault family, owner of fashion conglomerate Kering and investment firm Artemis, which offered €100 million (£86 million). This was followed shortly after by Bernard Arnault, owner of luxury brand LVMH, who offered €200 million (£173 million). Owners of L'Oreal, the Bettencourt Meyers family, have also donated €200 million according to Sky News, while the CEO of French energy company Total has promised to donate another €100 million. This, along with additional funding ring-fenced by Paris mayor Anne Hidalgo and Ile-de-France president Valerie Pecresse, bring the total above €600 million (£518 million). In addition, Aviation companies Air France and Air France-KLM have promised free transport for anyone involved in the re-construction process. 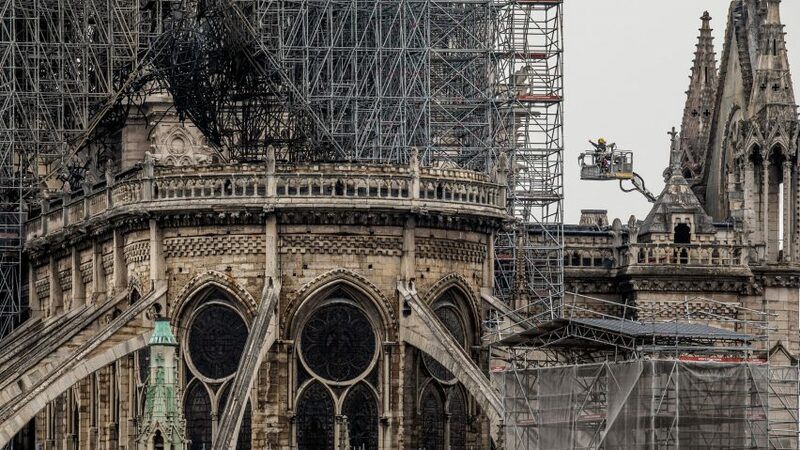 Fire raged through the 850-year old French landmark for nine hours as fire fighters battled to save the gothic cathedral and its priceless artefacts. While much of the roof and the spire were lost, the main stone structure has survived including the two bell towers, the altar and the stained glass rose windows. According to experts the survival of the stone structure was down to the skill of the original medieval architects and stonemasons. "It's a wood-vaulted building, the stone vaulting of the church was developed in the 12th century as a hedge against fire," Paul Binski, professor of the history of medieval art at Cambridge University told Dezeen. "The wooden roof will have collapsed onto the top of the vaults, the stone vaults will have inhibited the fire damage on the inside of the church," he added. "I'm optimistic that they'll be able to [rebuild], but it will take time and money." The rebuilding process will take at least 10 years, possibly decades, depending on how stable the fire-ravaged stone is. Assessments of the damage are currently underway. Artworks that were saved from the fire will be stored at the Louvre art gallery in Paris for safekeeping, reported the Guardian. Main image by Dan Kitwood for Getty Images.